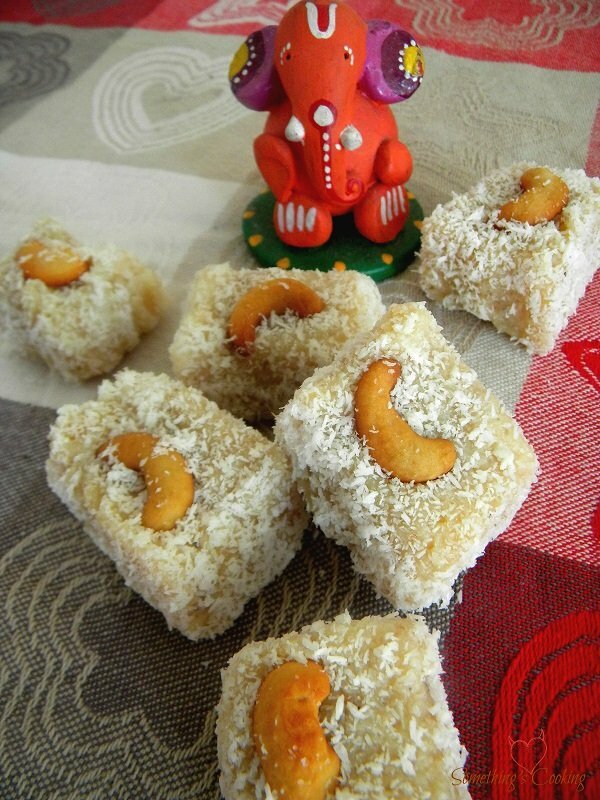 Yes, it’s the birthday of Lord Ganesha and this time I am bringing to you one of his favorite sweets- Coconut Barfi. Usually celebrated with pomp and style in the state of Maharashtra, it is believed that one should not look at the moon this day. 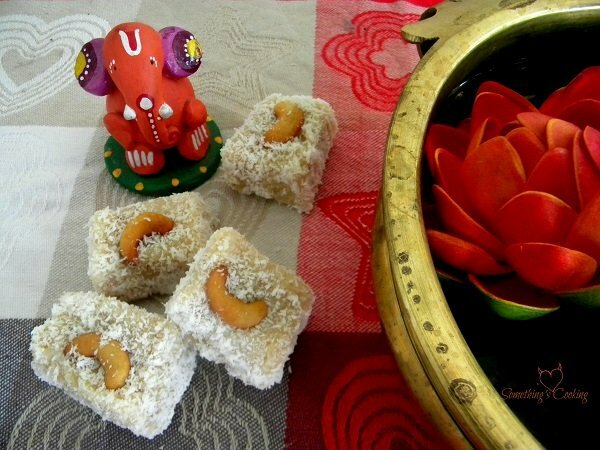 Lord Ganesha loves coconut, bananas, puddings and especially modaks. Modaks are steamed sweet dumplings. 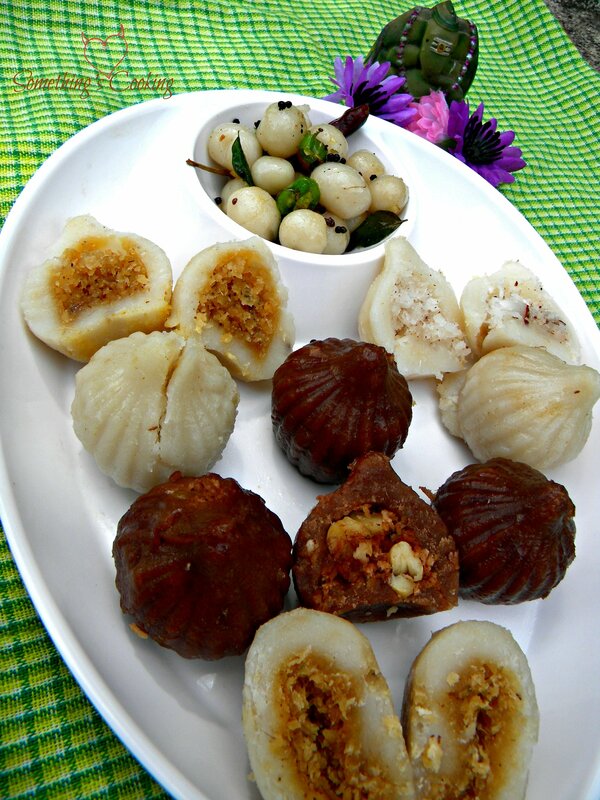 You can check three different types of Modaks I have prepared – Chocolate Modak, Small Modak called Ammini Modak and the traditional jaggery and coconut filled Sweet Modak. This year, I have prepared Coconut Barfi. Barfis are made with condensed milk or sugar along with fruits, nuts and spices. This easy coconut barfi is made with coconut, cashews and cardamom. This sweet is also served during weddings and festivals like Diwali. Add desiccated coconut and toast for a minute. To it, add condensed milk, mix and cook on low flame. Add cardamom powder and milk. Mix again. Cook it until the mixture gets quite thick. This will take around 6 mins. Be careful not to brown the mixture. Grease a flat bottomed vessel with ghee. Pour this mixture onto it and flatten with a spatula. Refrigerate for an hour and cut into desired shapes. Roll on desiccated coconut and garnish with cashews. You can store in airtight container for up to 4 days. I would prefer to refrigerate them and bring down to room temperature before eating. Mouth-watering recipe! 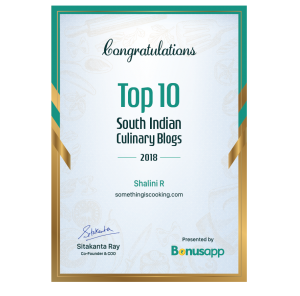 Love everything about this recipe, its simple, its tasty and even if I don’t get it right, with such delicious ingredients, I am sure I’ll still polish it off! Lovely Shalzz! It is always said the more experianced you are, the more quality you have, which is shown in your blog. Yummy Shals and as tasty as the coconut burfi your modaks too look awesome!! The concept of connecting the barfi with the wonderful past is a great idea…it was an interesting read. The concept of the picture with the cute little Ganesha was lovely to read. How Lovely! Barfis with the cute Ganesha look so nice. I also like the idea of chocolate modak! Havent tried it actually. 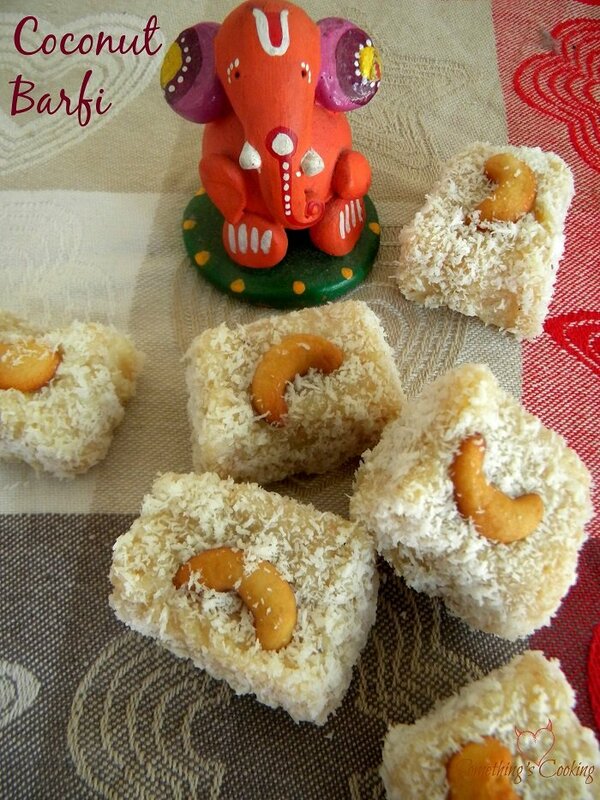 Yummy 🙂 Happy Ganesh Chaturthi, love coconut barfi. Thanks for sharing the recipe. Happy Ganesh Chaturthi. The barfi looks absolutely delicious and seems easy enough. The trouble begins when I actually start the cooking – I never seem to get it right. The modals look lovely too. Loved how you connected the recipe with your memories 🙂 beautiful! !